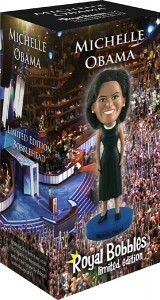 This exclusive limited-edition Michelle Obama bobblehead celebrates and commemorates her new status as the First Lady. This model recreates her official White House portrait, with Michelle wearing the same outfit that she wore in that photo. Show your support for Michelle Obama with the best likeness of her anywhere. This bobblehead is shipped in a colorful collectors box, with molded styrofoam protection inside.